Sister Jennie Lechtenberg is a member of the Sisters of the Holy Names of Jesus and Mary. She founded PUENTE Learning Center in 1985 in East Los Angeles and it developed into a nationally and internationally renowned educational center for children, youth, and adults. 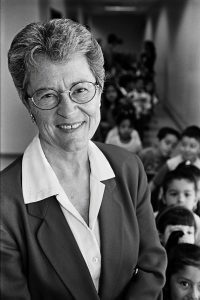 During a sabbatical in 1983, Sister Jennie began tutoring programs for low-achieving first- and second-graders at several public schools in Boyle Heights. She quickly realized the children that struggled the most came from homes in which parents had not had the opportunity for basic education and/or lacked English proficiency. To enable parents to assist their children academically, she initiated an English-language-acquisition class for adults, which served as the foundation for PUENTE as an intergenerational, family-oriented educational organization. Today, PUENTE’s curriculum combines traditional classroom instruction with computer technology to meet the educational needs of over 3,600 students annually at campuses in Boyle Heights and South Los Angeles. Prior to founding PUENTE, Sister Jennie served for 30 years as an elementary school administrator, as well as a teacher in elementary and junior high schools in East Los Angeles. Sister Jennie earned a bachelor’s degree from Holy Names College in Oakland, California. She has been the recipient of numerous awards and honors.